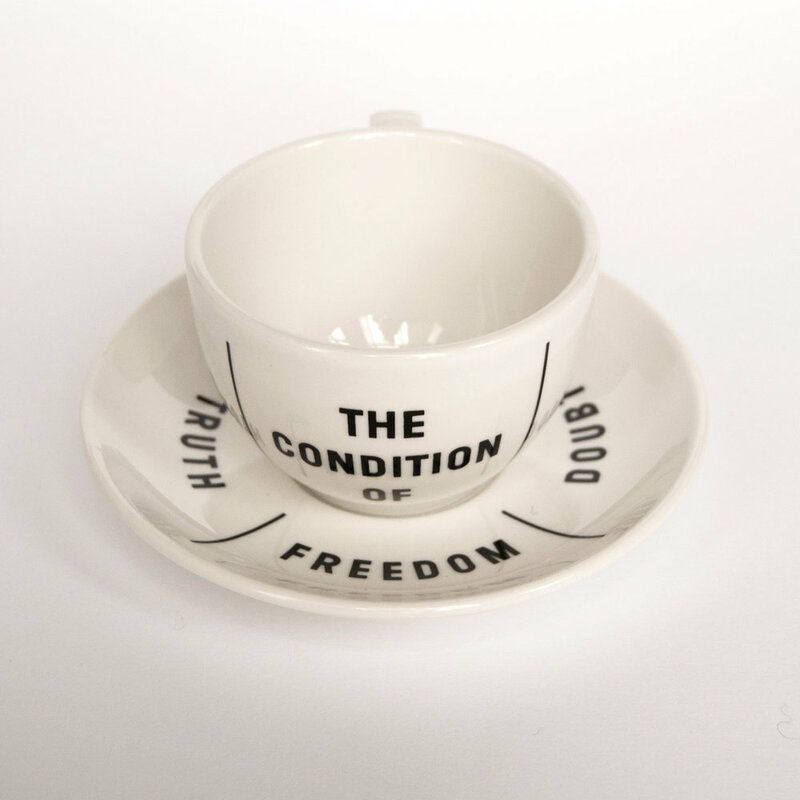 My cup of thoughts is a cup and saucer depicting thought provoking statements in various combinations, and was available in a limited edition at Droog. They are permanently used in Cafe Droog. It is part of the permanent collection of Centraal Museum Utrecht and Philadelphia Museum of Art. What is the idea behind your design for the coffee cups? Drinking coffee is often used as a moment for reflection and communication. The English author Sydney Smith mentioned that “If you want to improve your understanding,” you should “drink coffee”. And Sheik Abd-al-Kadir, (10th century), confessed that “no one can understand the truth until he drinks of coffee’s frothy goodness.” Coffee is seen as a symbol for improving our erudition, and futures can be predicted in the leftovers. It’s within this realm that the texts on the cups and saucers provide food for thought. They playfully question our changing perceptions of subjects like freedom and truth, inviting the consumer to make up their own mind. How did you experience working with ‘deadstock’ instead of designing a product from scratch? It was my reason for accepting the invitation for this project. We – in the west – are massive consumers of goods, resources and food. If we want a qualitative future we seriously have to change our consumerism and our mentality. A project like ‘UP’ contributes to this urgent need for change. Due to an increase in environmental consciousness in today’s society, a lot of waste is recycled or ‘upcycled’. What do you think of this? This is of the utmost importance, and designers can play a very meaningful role here. They are specifically trained to see doors where other people see walls. We’ve often heard ‘design can save the world’. Tell me your thoughts? Of course it’s utterly naïve to believe that design can save the world, and it would be self-congratulatory to think that designers have this ability. Global problems are becoming too complex, layered and with too many irreversible realities. At first it needs a global mentality-change, alternative economies and utopian power structures. But what arts and culture – and thus design – can do, is provide “food for thought” for this changing perception. They can help to shift our perspectives and develop tools to understand our reality and deal with it in a more sustainable way.